Marie Lynn Toussaint, Cook County Assistant Public Defender and Chairperson for the Haitian Congress to Fortify Haiti, in the communal library in the Cook County Circuit Court building in Skokie, IL. When she was 11, Marie Lynn Toussaint immigrated to the United States with her sister May from the small town of Bainet, Haiti. The girls joined their parents and five siblings who already were living in north suburban Evanston. But even as the family looked forward to a better life, Toussaint struggled to adjust. “When I came here, I was the oddball in school,” she recalls. Forty-two years later, Toussaint, 52, has centered her life and work on serving marginalized people. Some are immigrants like her; others are people charged with committing a crime. 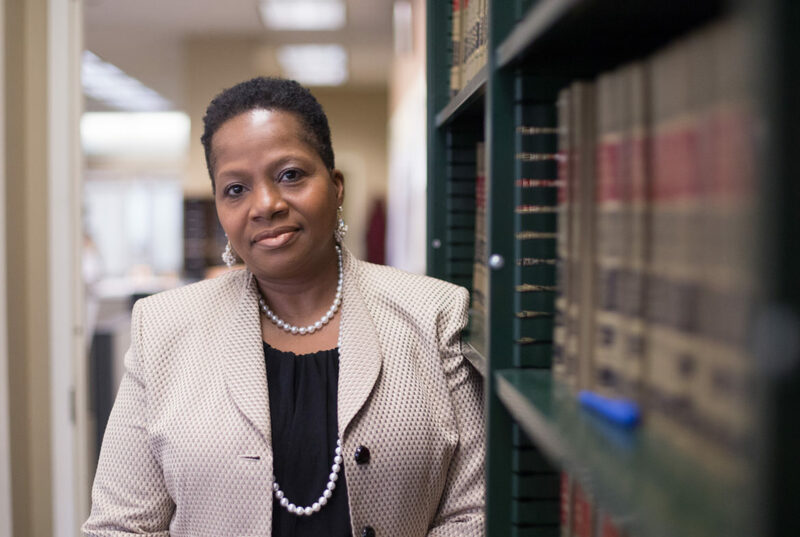 In addition to serving as a Cook County assistant public defender for the past 20 years, she advocates for Haitians in Haiti and the Chicago area as chairperson of the Haitian Congress to Fortify Haiti. The organization was formed to collect funds to aid victims of Hurricane Jeanne, which devastated Haiti in 2004. Since then, Toussaint has organized programs to educate younger Haitians about the country’s history. From 2006 to 2012, she also helped amend the 1987 Haitian Constitution so that Haitians in the Diaspora could hold dual or multi-citizenship. She helped organize a trip to Haiti in 2013 with the National Association for the Advancement of Colored People and met with the Haitian president and other political leaders about immigration and other issues. This March, the Haitian Congress with the Youth Technology Corps will establish a program to teach Haitian youth how to build computers at Groupe d’Action Francophone pour l’Environnement’s community center in Kenscoff, Haiti. The Chicago Reporter sat down with Toussaint to talk about the Haitian community in the Chicago area and the Haitian Congress’ advocacy work. What is the Haitian Congress to Fortify Haiti? We are a not-for-profit that focuses on Haitian culture, and we focus on educating those here from Haiti. The goal is to solidify ourselves so that we can participate and reintegrate into the day-to-day lives of the Haitian people. What role does the organization play in the Haitian community in the Chicago area? We celebrate all the national holidays like the day Haiti received its independence, January 1, 1804. Haiti was the first black republic to become independent in the world. …The effect that the slave revolt had around the world remains our legacy. It doesn’t matter the state that Haiti is in now. There’s political unrest and a lot of issues, but our history remains our history. What kind of feedback have you gotten about your educational programs? People come to some of these events, and some say, “Wow, I didn’t know that about Haiti.” Because who teaches it? And I know Dr. Google is around and people can Google stuff, but ironically, a lot of people don’t or they have to hear something that prompts them—well, let me go check it out and read a little bit more. Is there a distinct Haitian community here? All immigrants—not strictly Haitian people—have similar issues. Adjusting to the climate is one. Adjusting to the rules and regulation. Adjusting to the culture. …Haitian people, we don’t suffer differently than any other immigrant or foreigner who has to come from another country and learn the ways of the United States. How do you help immigrants who have just arrived in Chicago from Haiti? If they’re looking for social services, we tell them where to go, who to contact. We have a network of Haitians and Haitian professionals, who are available to help. Those who are not naturalized because of their status need temporary protective status. A lot have immigration issues, but we have a broad spectrum of issues. As an aside, if as leaders of the Haitian community, [Cook County] Judge Lionel Jean-Baptiste [former chairman and founder of the Haitian Congress to Fortify Haiti] and I can help the community, we will. Why did you focus on building computers in Haiti? The need is great. It teaches them a trade. It helps them to get a job anywhere in the world. The computer language is universal. It’s like math. Math is universal. If Haitians were to stay in the country or leave or go anywhere else, that skill would never be taken away from them. It’s crucial that we do this in Haiti. Why is this so important for Haiti? Haiti has a high illiteracy rate. Many of the parents cannot afford to send their children to school. This program is free. They can learn. They can become productive members of society. Simply because they don’t have money doesn’t mean they have to remain in the same socioeconomic level. They can work for a company. They can work for themselves. It will give them a chance at life. Tell me why you got involved in this kind of work? When I came here, a lot of kids were nice to me, but some were always mean to me too. When I got older, I understood why they were making fun of me. I spoke weird, I didn’t speak English well and when I did, I spoke with a heavy accent. One group of folks thought I was interesting, and the other group thought I was stupid because I couldn’t connect, I couldn’t relate to them. And I thought when I got older I could participate and teach other kids it’s OK to be whatever you want. If you speak with an accent, you speak with an accent. If you don’t know how to speak English, so what? … It’s important to know who you are and to study your own background. People don’t necessarily tell you the good things about your background. They may tell you the bad ones, but you have to take the time to study where you’re from, your ancestry, your country. The United States is a hodgepodge of people from all over the world. And everyone has their own piece of history in their homeland and in the U.S. So I think if you don’t know who you are, how do you know where you’re going? Yuri is an intern for The Chicago Reporter. In a move that would cause an under-count of immigrant communities, the Trump administration is building on a long history of using the census to undermine and obscure people of color. The Supreme Court upheld targeted internment during World War II, but public opinion is key to delegitimizing its use against Muslims in the Trump era.